Panini are sandwich-like food items, Italian in origin, but now international. In Italy, a panino (Italian pronunciation: [paˈniːno]) is customarily made from a small roll or loaf of bread, typically a ciabatta or a rosetta. The loaf is cut horizontally and filled with salami, ham, cheese, mortadella or other food, and sometimes served hot after having been pressed in a grill. 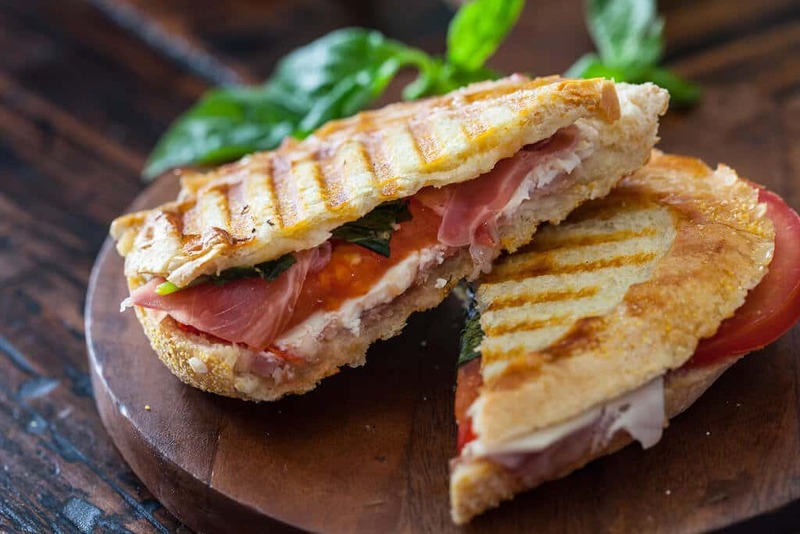 A toasted panino, colloquially called “toast” by Italians, is made out of two vertical slices of pane in cassetta almost invariably filled with prosciutto and a few slices of cheese, grilled in a sandwich press. In Central Italy, there is a popular version of panino which is filled with porchetta, i.e. slices of roasted pork. It is traditionally served without any kind of sauce or topping. Some maintain they are the same as ‘toasties’ but with a different shape. The word panino [pa’ni:no] is Italian for “small bread roll”; its plural form is panini. The word is the diminutive form of pane (“bread”). Outside Italy, panini is often used as a singular word (like salami, also an Italian plural noun) and sometimes pluralized as paninis. In Italian, panino refers properly to a bread roll and a panino imbottito (literally “stuffed panino”) to a sandwich. A paninoteca is the word for a sandwich bar. “Panino” is also often used to refer to sandwiches in general. Although the first U.S. reference to panini dates to 1956, and a precursor appeared in a 16th-century Italian cookbook, the sandwiches became trendy in Milanese bars, called paninoteche, in the 1970s and 1980s. Trendy U.S. restaurants, particularly in New York, began selling panini, whose popularity then spread to other U.S. cities, each producing distinctive variations of it. This entry was posted in Panini and tagged Panini, Prosciutto. You are absolutely right. I hate people misunderstand Panini as grilled sandwiches.